Jefferson Bank & Trust Co.
On April 2, 1956, Jefferson Bank & Trust Company celebrated the opening of the first new bank building constructed in the city of St. Louis since 1928. This modern building designed by W.A. 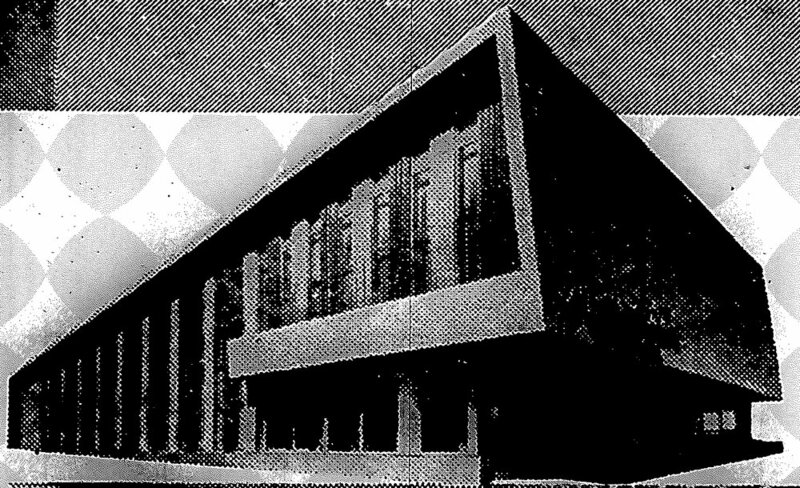 Sarmiento of the Bank Building & Equipment Corporation of America featured eight drive-in banking windows and walk-up and drive-up night depositories in detached modernistic cycloids with oddly projecting flat roofs. This pattern was designed to enable cars to circle around, facilitating ease of traffic flow. Cost of the new structure was projected to be $650,000 and was built on the site of the ‘historic’ Coliseum and the legendary Uhrig Cave (legendary beer cellars). Between 1956-1963, the bank grew from $22 million in assets to in excess of $52 million. The site of the Jefferson Bank & Trust is also known historically as one of the sites of demonstrations by the Congress of Racial Equality, or CORE, during the 1960s. In 1941, a group of theological seminary students, both African Americans and White, began the committee of Racial Equality at the University of Chicago. They met every Saturday afternoon on campus. The members of the group were primarily concerned about the cause of peace. They had followed with keen interest the Gandhi movement in India and were greatly influenced in their thinking by the power of the nonviolent method as expounded by Gandhi and as practiced by the Indian National Congress. The St. Louis chapter of CORE started in 1947 with a guest speaker named Bernice Fisher. She galvanized the group into action that was destined to alter the racial climate of St. Louis. Fisher resided in St. Louis and worked as an organizer for the United Wholesale and Distribution Workers of America, which later became the Teamsters Union. She was instrumental in the early discussions held at Irvin and Maggie Dagen's home. The meetings consisted of a diverse group of people, who would be responsible for integrating Washington University, and most St. Louis' public accommodations. High on CORE’s list of action items was seeking fair treatment of Blacks by local banks. This was a theme that was rampant across the country that CORE could make progress into both with public demonstrations and private meetings. Many years later, the Jefferson Bank & Trust Co. built a new bank on Market Street a few blocks east and moved to that new location, but that design was not done by the Bank Building & Equipment Corporation. The original building currently serves as office space.